Our Freedom Hi-Impact Accommodator™ insert blends support and comfort with incredible durability. The energy-absorbing heel will withstand the most demanding activities. See why we are so sure these Read more.. 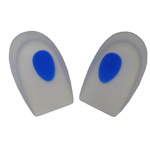 Designed to cup the heel area to enhance the body’s ownnatural shock defense system, these heel cups are made of the highest qualitymedical grade silicone. A built-in “blue dot” pressure relief area Read more..
A specifically formulated polymer to relieve heel pain. 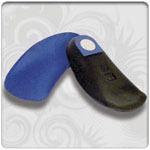 Puppeez heel spur pad has a removable teardrop for cushioning and abrasion resistant anti-bacterial fabric covering. Puppeez fit both left and Read more.. Choose from our arch supports and orthotics devices to help conditions such as plantar fascitis, heel spur, and all pain-generating foot conditions.